From building blocks to city blocks, an eye-opening exploration of how children's playthings and physical surroundings affect their development. Parents obsess over their children's playdates, kindergarten curriculum, and every bump and bruise, but the toys, classrooms, playgrounds, and neighborhoods little ones engage with are just as important. These objects and spaces encode decades, even centuries of changing ideas about what makes for good child-rearing--and what does not. Do you choose wooden toys, or plastic, or, increasingly, digital? What do youngsters lose when seesaws are deemed too dangerous and slides are designed primarily for safety? How can the built environment help children cultivate self-reliance? In these debates, parents, educators, and kids themselves are often caught in the middle. Now, prominent design critic Alexandra Lange reveals the surprising histories behind the human-made elements of our children's pint-size landscape. Her fascinating investigation shows how the seemingly innocuous universe of stuff affects kids' behavior, values, and health, often in subtle ways. And she reveals how years of decisions by toymakers, architects, and urban planners have helped--and hindered--American youngsters' journeys toward independence. Seen through Lange's eyes, everything from the sandbox to the street becomes vibrant with buried meaning. The Design of Childhood will change the way you view your children's world--and your own. Alexandra Lange is an architecture and design critic whose essays, reviews, and features have appeared in design journals, New York magazine, the New Yorker, the New York Times, Curbed, Design Observer, Dezeen, and many other publications. She received a PhD in twentieth-century architecture history from the Institute of Fine Arts at New York University. She is the author of Writing about Architecture: Mastering the Language of Buildings and Cities, the e-book The Dot-Com City: Silicon Valley Urbanism, and co-author of Design Research: The Story that Brought Modern Living to American Homes. She lives in Brooklyn, New York. 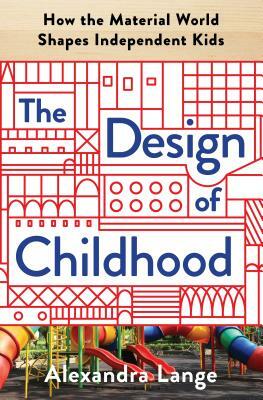 "The Design of Childhood is as revelatory with lessons about the history of design as it as with lessons about childhood . . . The book achieves the rare trick of staying relevant and compelling to an audience of planners and urban designers even when the subject ostensibly on matters of smaller scale than what we think of as the built environment." - Planetizen, "Top Ten Urban Planning Books of the Year"
"It's normal for parents to obsess over their children: which school should they go to, which kids should they play with, what sport they should play. Design critic Alexandra Lange makes the case for the importance of objects and design in this canny new book, arguing that the way kids play (and the objects they play with) play an essential role in their development. Is there a difference between wood, plastic, or digital toys? What can kids learn from a see-saw or a slide? It may seem trivial but the way we play, Lange argues, reflects the way we live." - ArchDaily, "The 2018 Gift Guide"